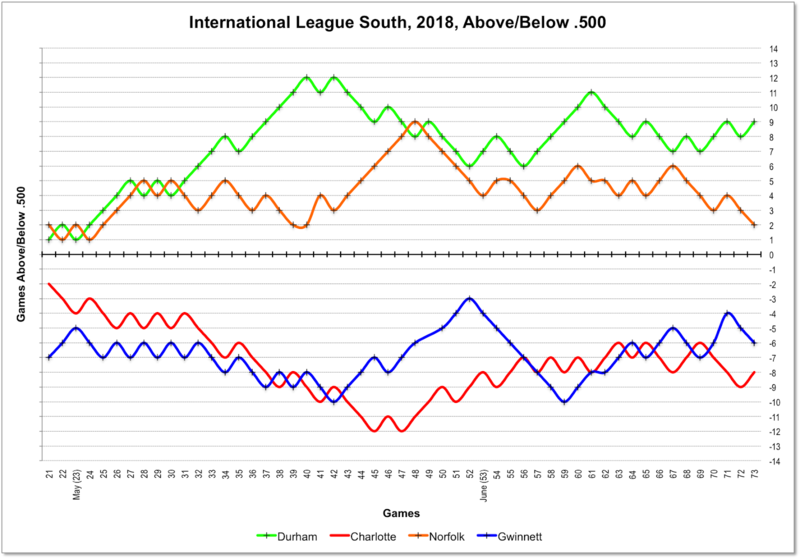 The Bulls had another good road trip, winning four of six games against the Louisville Bats and the Indianapolis Indians. Perhaps the highlight of the trip was the breakout hitting of young Brandon Lowe. His OPS soared from a pretty dismal .448 to a very solid .929 and included 5 home runs and 9 RBI. His batting average went from .196 to .263 over the six games. Ji-Man Choi also had a good trip, but left the game yesterday after getting hit in the face by an elbow as a runner passed by. His OPS is a stunning 1.056 over his first 10 games with the Bulls. Overall, the Bulls seemed to have survived the departure of Willy Adames and Jake Bauers. Now if they could just win some games at home. Jake Bauers had a game-winning, 12th inning home run yesterday to beat the Yankees and complete a three-game sweep of the Yankees at home ... and they even had some fans watching the game! The Charlotte Knights were just here and they are back. They are not having a good year, which doesn't mean they don't do well against the Bulls. Just last week they were also in town and swept the Bulls. OK, is it time to talk about the uniforms? Just for the record, I don't like them. First, I like nameplates on jerseys. What happens if I don't have a program? Or it's a new player? Second, I'm no fan of the new Bull City logo. I get it, Durham paid millions for the stadium upgrade, they get to call some shots. But it's ugly. Last night's performance by Bulls hitters was simply stunning. Seven out of nine hitters improved their OPS, some by substantial margins, in just one game. One, Ji-Man Choi, albeit from a very small sample so far, jumped up 300 points with 2 home runs! Lowe and Hazelbaker had good nights. The Bulls head up the road to second-place Indianapolis where they face a team that is a very close match to the Bulls in most categories. The Indians are a formidable hitting team, a decent ERA, but their team WHIP is not good at all. 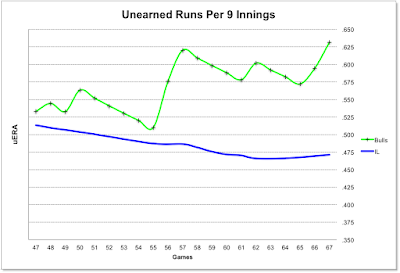 That may help explain their similar won-loss record, but much lower run differential. Should be a good series. Well, this home stand was a disaster. 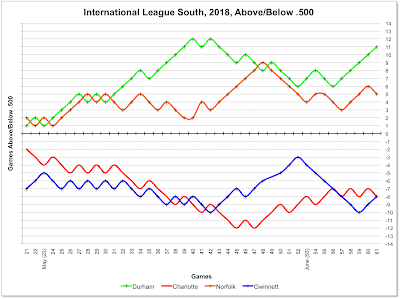 The Bulls lost 5 out of six, with a run differential of -10 over the six games. 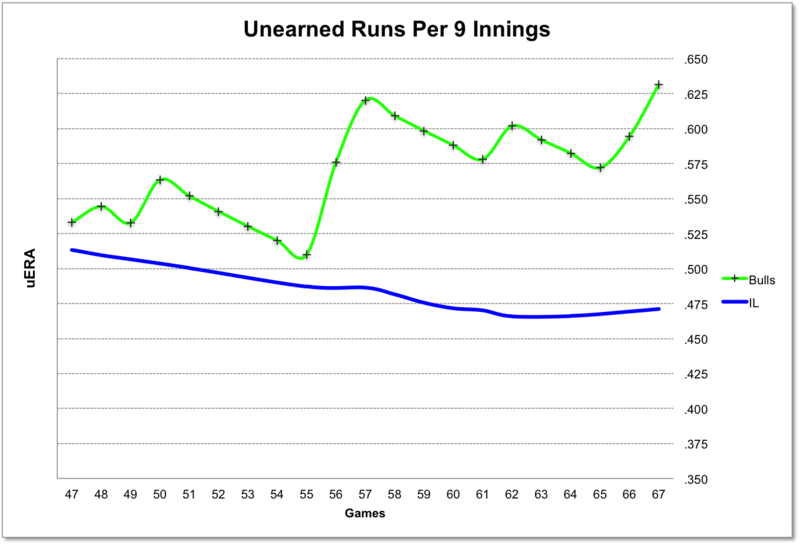 And of the total of 21 runs given up, 7 were unearned (see chart below). About the only nice thing that could be said of the week was that it was great to see Kevin Kiermaier in a Bulls uniform. On the other hand, it was painful to see the difference between a major leaguer and what we saw on the mound, at bat, and on the field. Why? Well, part of it stems from the four hitters who are below .600 OPS: Brandon Lowe, Ji-Man Choi, Jeremy Hazelbaker, and Micah Johnson (although Johnson just went on the disabled list). Of those, three are below the Mendoza Line (batting average of less than .200). Only one hitter on the Bulls is over .800 OPS, Kean Wong. Pitching isn't all that bad. The team ERA and other metrics are among the best in the IL. But the fielding has been awful. 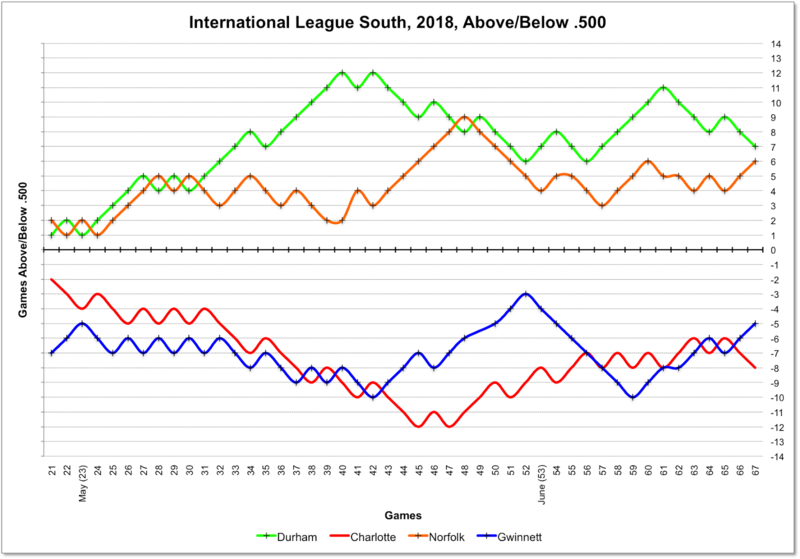 Nevertheless, even though they can't seem to win at home, the Bulls remain, just barely, in the IL South lead as they head off to Louisville and Indianapolis. 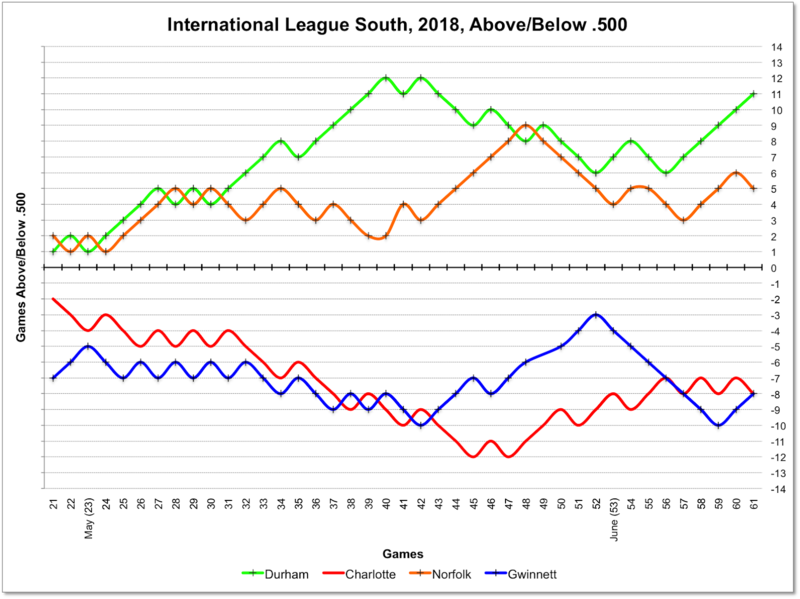 The Bulls are a half game ahead of Norfolk. This is just plain ugly. Bulls mistakes have cost them 41 runs on the year. What's wrong with this picture? 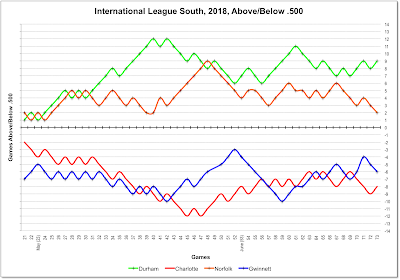 The last homestand the Durham Bulls lost 4 and won 2 against lightweight competition. Then they went on the road, also against sub-.500 teams, and won 5 and just lost 1. 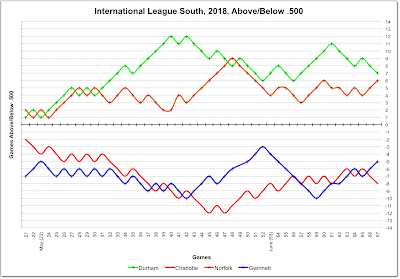 Now they are back home and have dropped the first three games to the worst teams in the South Division. Not to oversimplify, but there's a good chance that it has something to do with lineups like last night's. Two batters were below the Mendoza Line (.200): Hazelbaker and Lowe. As much as aggressive baserunning is fun to watch, watching a pickoff and caught stealing (Lowe) was tough. New guy Ji-Man Choi is probably going to turn out OK, but he's had several opportunities to knock runners in and he hasn't in these early days. Of course, missing Adames and Bauer, as well as Anthony Banda for the season, makes a difference. And it's just June. But it's also coming up on mid-season and playing at home should be more fun.